This article attempts to profile the three cities of the Province of Batangas, i.e. 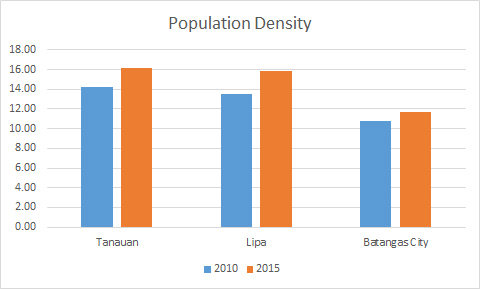 Batangas City, Lipa and Tanauan, based on demographics and competitiveness. This article is published for no other purpose than the information of the reader. The data published here has been taken from the official web sites of the Philippine Statistics Authority as well as the Cities and Municipalities Competitiveness Index. City population graph shows growth from 2010-2015. 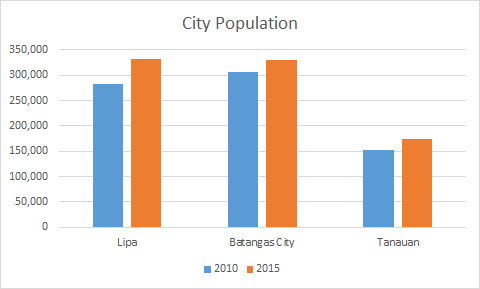 As per the national census undertaken in 2015 by the Philippine Statistical Authority (PSA), Lipa City has now become more populous than Batangas City and is now the most populated city or municipality in the entire province. Population density for the three cities in 2010 and 2016. 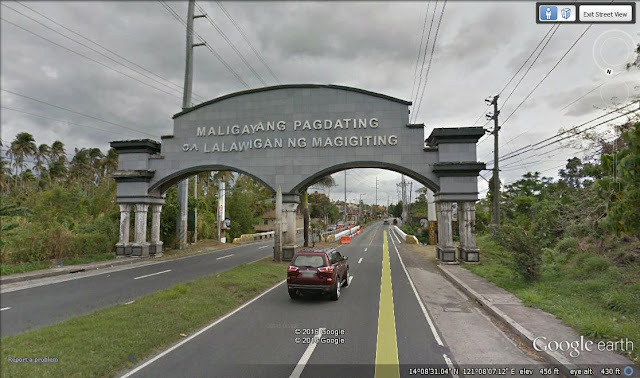 Although Tanauan City has been overtaken by its neighbour, the Municipality of Sto. Tomas, in terms of raw population as per the 2015 national census, it is still, however, more densely populated that either Lipa or Batangas City. Competitiveness in the context of this article is based on three major pillars: economic dynamism, government efficiency and infrastructure. 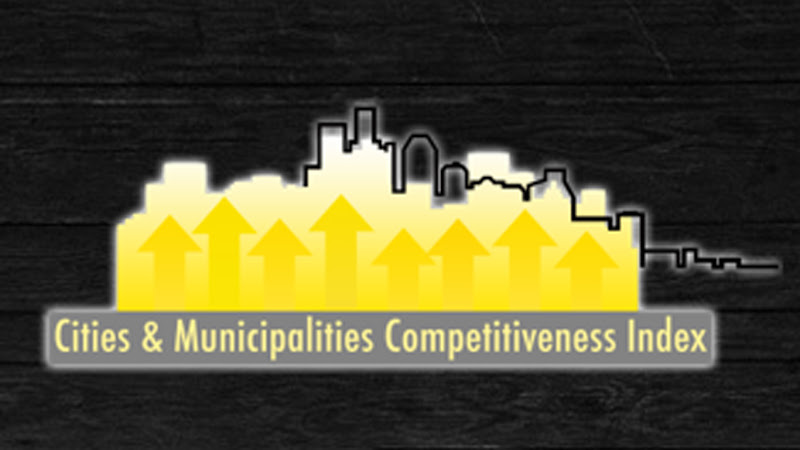 The data contained in this section is culled from the 2015 results of the annual Cities and Municipalities Competitiveness Index measured by the National Competitiveness Council from data collected and submitted by the Regional Competitiveness Committees. 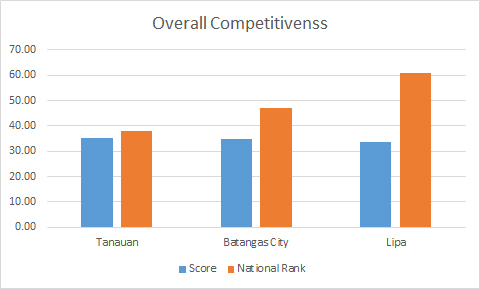 Overall competitiveness of Batangas' cities among 142 cities nationwide. Lower orange bar is better. The table below shows the overall scores of the three cities of Batangas Province in the competitiveness index and ranking among 142 cities measured nationwide, regardless of whether these are highly urbanised centres or component cities. Economic dynamism of Batangas' three cities and nationwide rank among 142 cities. Lower orange bar is better. 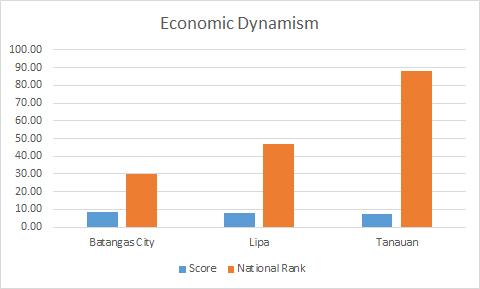 The table below shows the score and nationwide ranking of the three Batangas cities among 142 cities nationwide on the pillar of economic dynamism. Economic dynamism is measured based on the following parameters: size and growth of the local economy, capacity to generate employment, cost of living and of doing business, financial deepening, productivity and the presence of business and professional organisations. 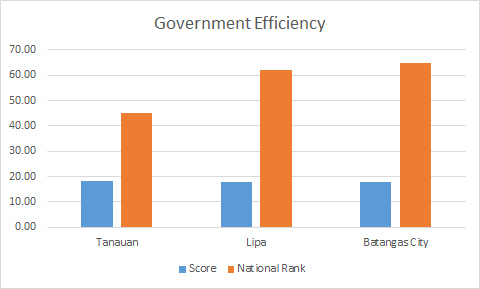 Government efficiency of Batangas cities and ranking among 142 cities nationwide. Lower orange bar is better. The following table shows how Batangas’ three cities fared in the pillar of government efficiency against 142 cities nationwide. Government efficiency is measured based on: transparency, economic governance, ratio of LGU collected taxes to LGU revenues, LGU competition related awards, business registration efficiency, investment promotion, compliance to national directives, security, health and education. 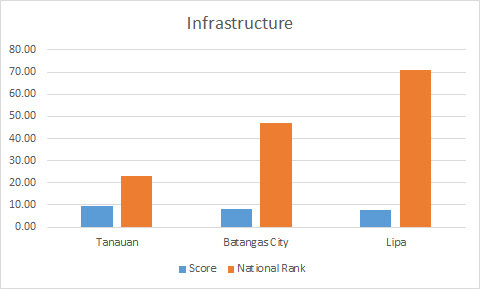 Infrastructure score of Batangas' cities and ranking among 142 cities nationwide. Lower orange bar is better. The table below shows how the three cities of Batangas ranked nationwide among 142 cities in the pillar of infrastructure. Infrastructure is measured based on: road networks, distance from city/municipality centres to major ports, DOT accredited accommodations, health infrastructure, education infrastructure, availability of basic utilities, annual investments in infrastructure, ICT connectivity, number of ATM’s and number of public transportation vehicles. Meanwhile, the Province of Batangas ranked 20th among 68 provinces measured nationwide. For those interested in verifying the information contained in this article or who wish to obtain more information about the competitiveness index, please follow this link to the official web site. Graphic image from the Cities and Municipalities Competitiveness Index web site.